Viglink is intext affiliate advertising network.It has some big names in its Board of Directors and other investors list.I heard about them few months back as a CloudFlare app.I tried them on this very site for some time.In this post I will write detailed review of Viglink. Viglink does not have strict traffic requirements.If you are using CloudFlare content delivery network then you can use it an as app.CloudFlare is free content delivery network.You can read this post about activating it for your website.If you are not using CloudFlare then also you can sign up for them. They do not have strict traffic requirement.New website owners can also get approved without any issues.As I signed up as CloudFlare user I can not make comment on approval time.But it does not take much longer. 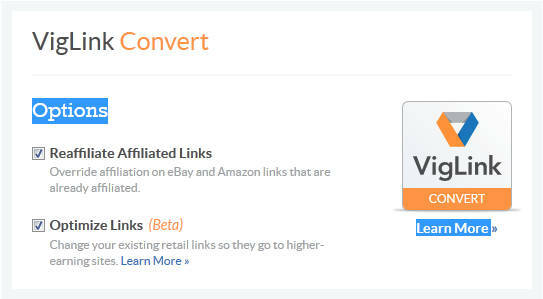 It converts your existing link into affiliate links.If a visitor clicks on that affiliate link and makes purchase your earn money.Lets understand its working with an example.Suppose you have added an Amazon or eBay link to your website.Then if you are using Viglink Convert then these link will be re-affiliated. Those links can also be re-affiliated to websites with more earning than your original link.This is indeed cool feature as it maximizes your earning. It converts your product or keyword references within content to affiliate link.According to Viglink website they have tie up with more than 30,000 retailers.90% of top 500 retailers have tie up with Viglink.So your content keyword and product references will be transformed into money making links using this huge network of retailers. This feature makes Viglink standout than other affiliate advertising networks.It allows you to make use of your social media reach for making money.You need to create short URL of your posts using Viglink Anywhere dashboard.After creating the short URL you can post it anywhere.You can post the newly created link on social media sites like Facebook and Twitter. You can post it on any other social networking site or in your emails as well.If a purchase is made using these links then you can make money.This method increases your reach.You are not restricted to website only. Viglink has no minimum payment threshold.This is indeed great feature to have.You do not have any minimum criteria to fulfill.The payment is Net-60.This means that if you have earned money today you will be paid after 60 days.You should not worry about this.This is a reliable network. Among major affiliate networks only Viglink offers no minimum payment threshold feature.The payment is made at end of every month using PayPal. 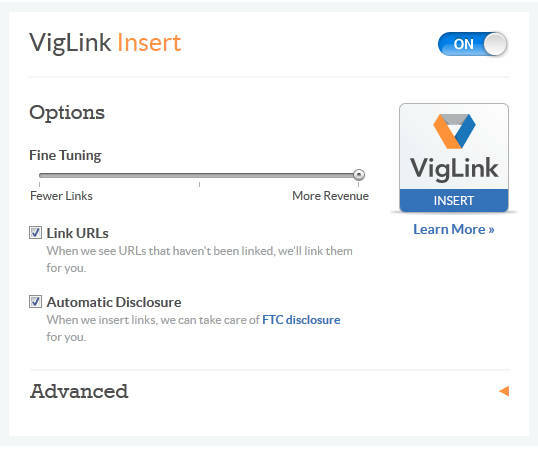 Viglink offers simple publisher dashboard.The user interface is simple and very clean.You can see your reports on per day basis.But I feel the reporting can be improved further.They should learn from Skimlinks in this field.Skimlinks offers better reporting feature than Viglink. It gives you idea about external links clicked.It also reports number of clicks non monetized links along with monetized links.It also reports click number of already monetized links on your website.I would like to see reports of different products as well.So that publishers can get idea about performance of the products. Except reporting other sections are detailed and simple.You need to copy a single ad code to enable all the product mentioned above (Convert and Insert both).You can also customize features of Convert and Insert at single place.It does not overwhelm you with myriad of options. You do not have to replace code from your site every time you make a change in configuration options.Add the ad code once and forget everything. Viglink offers referral program.You can earn 35% of commission received by Viglink for one year.Lets understand this with simple calculation.Viglink gives 75% to publisher and keeps 25%.You get 35% of this 25%.This is what I understood from above statement. Now if a purchase is made worth $100 from a link of your referral’s website then your referral gets $75.Viglink will get $25 and you will get 35% of $25 that comes down to $8.75.This is good amount of money no doubt.The best thing is you do not have to worry about minimum payment threshold.If a purchase is made in a month you can expect payment. Viglink is compatible with Google Adsense.You can use both of them on same site without any issues.I have run Viglink and Google Adsense together on this site with good effect.Since nature of both are different there is no risk of impact of revenue on either of them. You can also use this plugin to add Viglink on your WordPress website.Viglink also offers plugins for different platforms like Blogger,TypePad,Tumblr,phpBB,vBulletin. I searched Viglink for merchants from India.The reason is if they have merchants from India then you can make money from Indian traffic.I do evaluate every website on this parameter.Viglink provides merchant explorer tool.Using this tool you can search its merchant database.I searched it’s merchant database with India keyword.It returned around 28 merchants.There were few merchants with India in their name.If those merchants are filtered out than also it has decent number of merchants for Indian traffic. So if you have Indian traffic majorly then also you can use this advertising network with fair effect.I will like to see more number of merchants supporting Indian traffic.Also Amazon has started its operation in India.It will benefit Viglink users of India as well. So I would recommend using Viglink if you have product review website.You can also use it on websites on which affiliate marketing networks can be used.The benefit of using Viglink is that you do not have to apply for individual merchant as a publisher.You can use a single platform and get connected with more than 30,000 merchants. Viglink and Skimlinks currently does not support many Indian sites.You can check their merchant support to get the list of Indian merchants supported. i want to create cashback website. so, i m searching for the Master affiliate network site which has further tie ups with individual websites.. as i want to get affiliation with all the website like amazon, flipkart, snapdeal, paytm, makemytrip and others available in india and what i feel is not possible on individual basis. so how can that be possible. nice content ..thanks for sharing.